Cryptocurrency research and portfolio tracker application that runs from a mobile device, but is also available for Web and MacOSX platforms. Coin Stats is a cryptocurrency research and portfolio tracker application. It runs from a mobile device but is also available for Web and MacOSX platforms. The app allows users to manage their cryptocurrencies, including Bitcoin and over 3000 alt-coins within the app. The app allows to visit coins' social pages and websites to make research-based investment decisions. Coin Stats also has a feature to set price, limit, volume and market cap alerts to currencies, read the related news from over 40 sources. 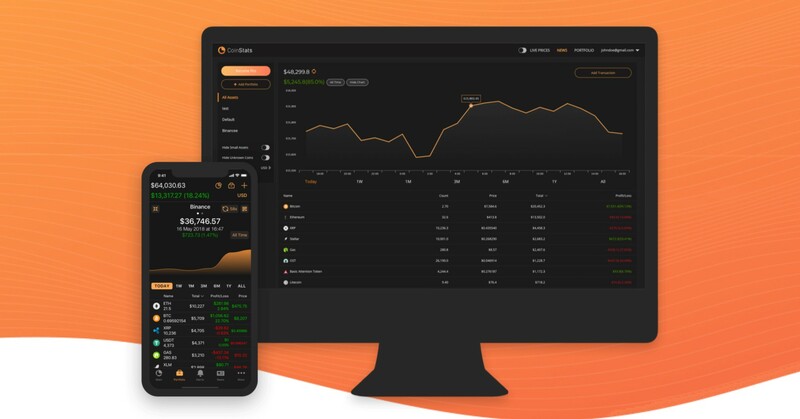 On top of that users can add their cryptocurrency trades into Coin Stats for tracking their net worth and profit/loss, including by connecting wallets and exchange accounts for auto-sync. It also allows users to compare their portfolios with friends and track their gains over time by means of portfolio sharing functionality. In the Telegram channel of Coin Stats there is a possibility to set up Telegram bots to get the latest prices and charts of coins.